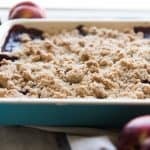 This Blackberry Nectarine Crumble has big, juicy blackberries and sweet-tart nectarines bubbling beneath a warm, buttery crumble topping. This blackberry dessert is one of the best things to make with blackberries! In a medium bowl, mix together the flour, sugars and salt. Pour the melted better and vanilla on top of flour mixture and stir together until everything gets most and crumbly. In a separate bowl (or even in your 9x13" baking dish to save having to wash an extra bowl! ), toss the nectarines and blackberries with the sugar, flour and salt until the fruit is evenly coated. Spread evenly around the bottom of the baking dish, then top with the crumble topping. Bake for 45 minutes, or until the fruit filling is bubbling up in spots between the crumble and the crumble has turned golden brown. Remove from oven and let cool 15 minutes before serving warm, topped with a scoop of ice cream.